Following the great success of the first edition of the Co-operative Banks Dialogue with Academics and Stakeholders organised during the International Year of Co-operatives, EACB is having the “Second Co-operative Banks Day with Academics and Stakeholders” entitled ”The Co-operative Difference: international evidence on a unique governance and a sustainable banking model” on 14th May 2013 at the European Parliament in Brussels. This event will be organised with the support of Federcasse and hosted by Gianni Pittella, First Vice-President of the European Parliament. 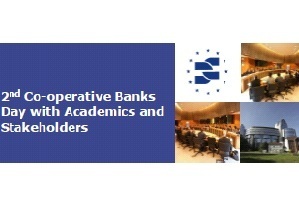 This Second Co-operative Banks Day with Academics and Stakeholders should allow researchers and academics but also policy makers, co-operative banks and relevant stakeholders to present their reflections and discuss their expectations for the future. This event will include two panels focusing on “State of the art in academic research: the unique governance of co-operative banks” and “Views of stakeholders on the role of co-operative banks to a more sustaina-ble banking”. Also two brand new studies entitled “Co-operative banks: international evidence” (New Economic Foundation) and “Resilience in a downturn: the power of financial co-operatives” (International Labour Organisation) will be presented. High-Level speakers, will include Gianni Pittella, First Vice-President of the European Parliament, MEP Patrizia Toia, author of the EP report on co-operatives, MEP Sven Giegold (tbc), and MEP Arlene McCarthy (tbc), members of the ECON Committee. The 2nd Academic day will be followed by a seated networking lunch in the Salon of the European Parliament. This event is by invitation only and registration will be on the “first come first served” principle due to the limited capacity of the meeting room. Please note that the event is fully booked. For the Pictures, presentations and all documents delivered during this event, please click HERE.